other catastrophic conditions ailing children right here at home. Starting today and extending through the end of the year, the Live L.A.
is available to every child the hospital treats. 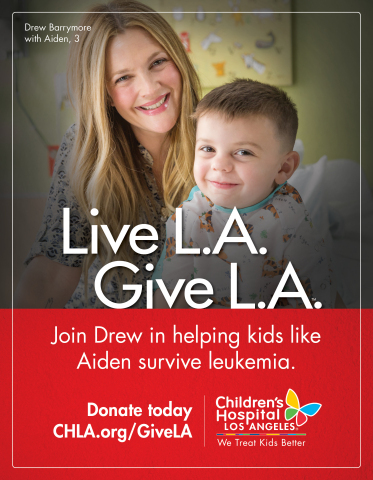 longtime hospital supporter, is leading the 2016 Live L.A. Give L.A.
campaign, inspiring families to give to Children’s Hospital Los Angeles. can be shared here, and around the world. The Live L.A. Give L.A.
to support the hospital’s Live L.A. Give L.A. campaign. Individuals who wish to support the campaign may donate online at CHLA.org/GiveLA. the critical, lifesaving care they need. dates will be announced closer to the end of the year. cash donation at designated CHLA booths within the concourse. child we treat receives the critical, lifesaving care they need.